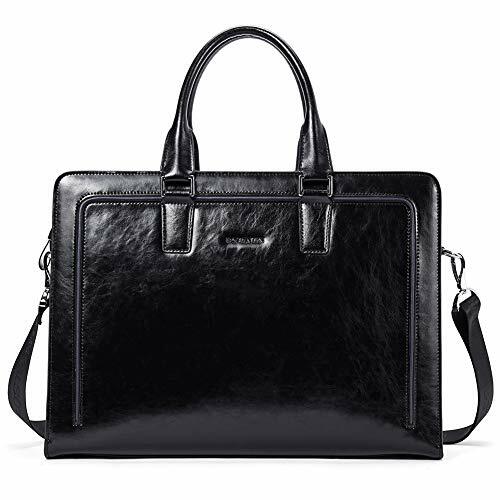 PERFECT LAPTOP BAG FOR TRAVEL, SCHOOL OR BUSINESS - Saddleback's Thin Front Pocket Briefcase looks great in the courtroom, boardroom or on the mountain trail. 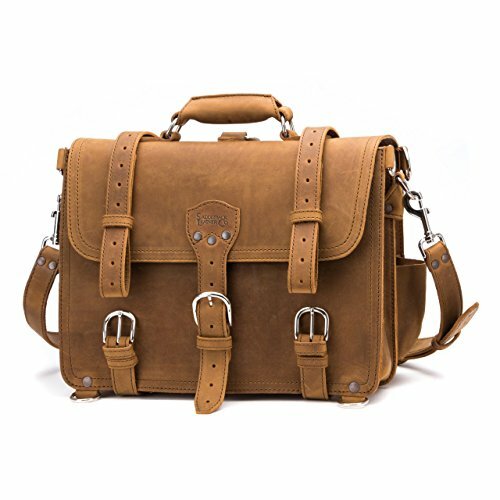 A favorite of executives, lawyers, attorneys, military personnel, police, college students and both men and women, this attache case can comfortably hold a 15" Macbook laptop computer. 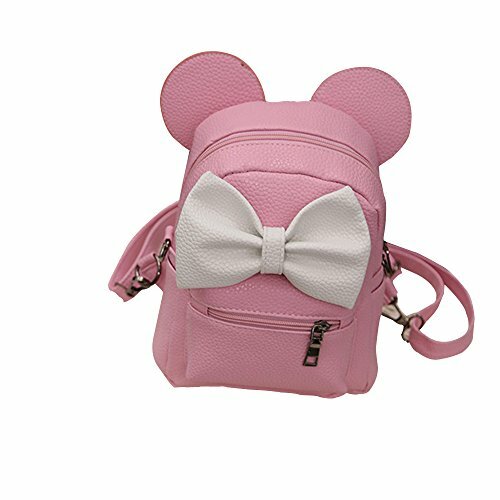 CONVERTS TO A BACKPACK - You can carry the bag over the shoulder, crossbody, by the center top handle or as a backpack. 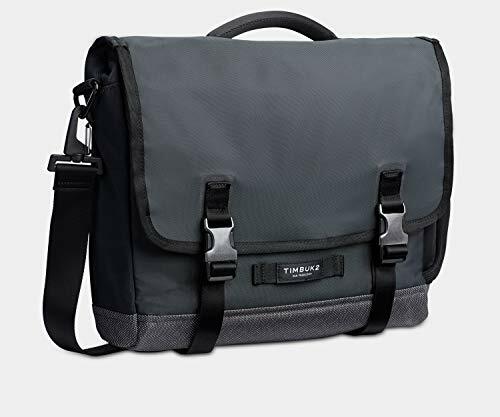 By looping the removable shoulder strap through the center back O-Ring and attaching the 2 clasps to each corner back D-Ring respectively, the briefcase easily converts into a comfortable leather backpack. 100 YEAR WARRANTY - We are so confident in the quality of leather designs, we back everything we sell with a 100 Year Warranty. Our company motto is "They'll Fight Over It When You're Dead". Whichever lucky grandchild inherits your briefcase, we'll be there to help them. 100% FULL-GRAIN LEATHER - The Thin Front Pocket Briefcase is crafted from tough, 100% full-grain leather, which takes hits well and looks even better with age. Full-grain is the top layer of the cow skin, which is the most expensive and durable part. Much higher quality than genuine leather, our leather becomes soft and supple as it ages. 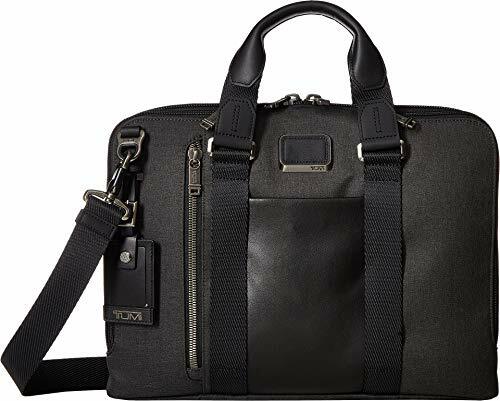 HIGHEST QUALITY MATERIALS - The Thin Front Pocket Briefcase is stitched with marine-grade polyester thread, which is 4 times as strong as commonly used Nylon thread, and reinforced with copper rivets for super durability. It is lined with tough but soft pigskin lining, that is even stronger than cow leather, and includes all stainless steel 316 hardware. 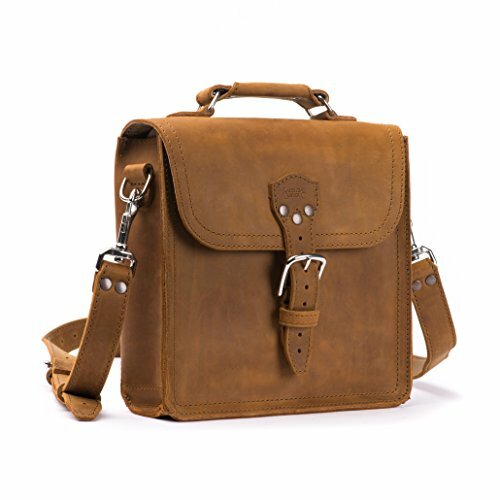 PERFECT FOR TRAVEL OR EVERYDAY CARRY - A variation of our popular Classic Briefcase design, the Front Pocket Briefcase looks great in the courtroom, boardroom or on the mountain trail. 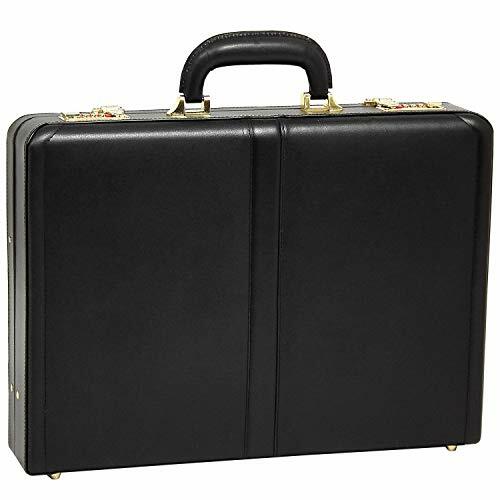 Countless positive testimonials from executives, lawyers, attorneys, military personnel, police and college students, both men and women, show why this is one of our best selling briefcases. 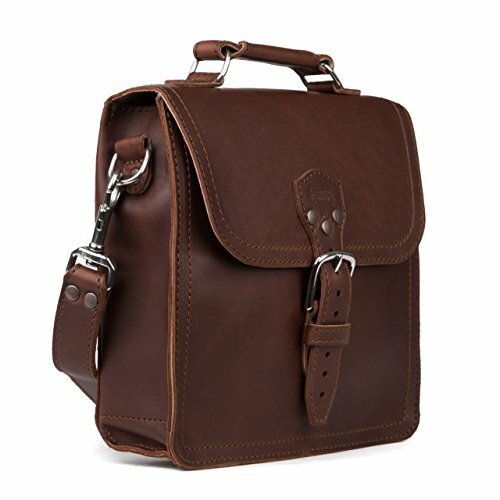 CONVERTS TO A BACKPACK - Carry the front pocket briefcase over the shoulder, crossbody, by the center top handle or as a backpack. 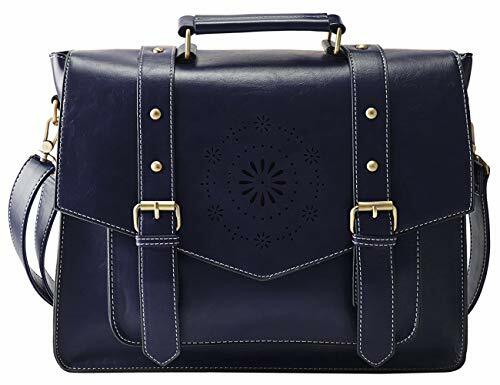 By looping the removable shoulder strap through the center back O-Ring and attaching the 2 clasps to each corner back D-Ring respectively, the briefcase easily converts into a comfortable leather backpack. 100% FULL-GRAIN LEATHER - The Front Pocket Briefcase is crafted from tough, 100% full-grain leather, which takes hits well and looks even better with age. Full-grain is the top layer of the cow skin, which is the most expensive and durable part. Much higher quality than genuine leather, our leather becomes soft and supple as it ages. 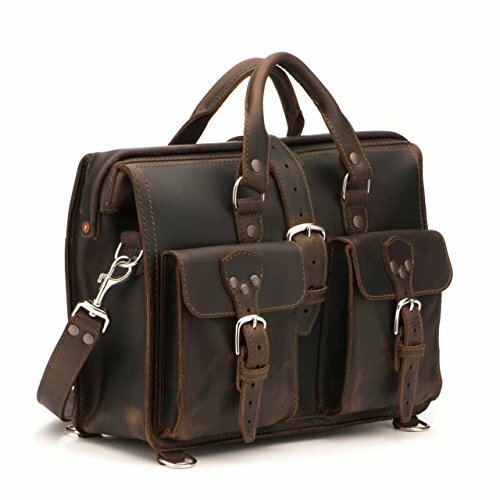 HIGHEST QUALITY MATERIALS - The Front Pocket Briefcase is stitched with marine-grade polyester thread, which is 4 times as strong as commonly used Nylon thread, and reinforced with copper rivets for super durability. It is lined with tough but soft pigskin lining, that is even stronger than cow leather and all hardware is surgical-grade stainless steel 316. 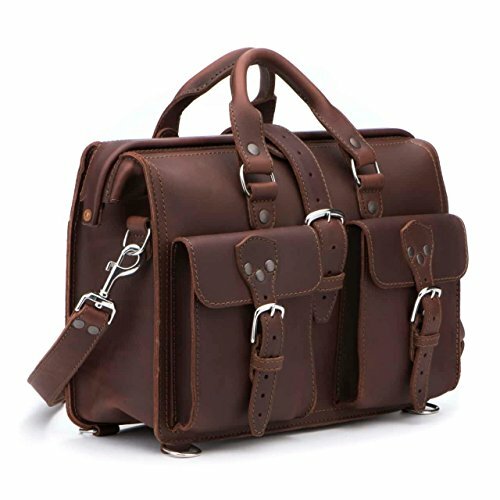 THE ORIGINAL SADDLEBACK BRIEFCASE - The famous bag that started it all, the classic briefcase looks great in the courtroom, boardroom or on the mountain trail. 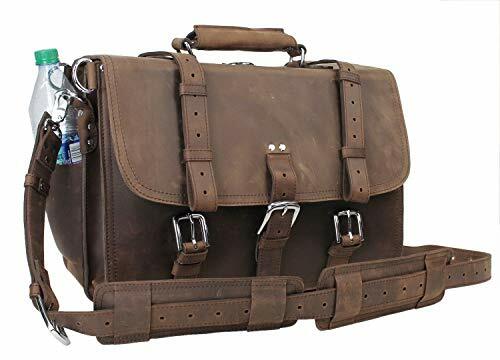 We have received countless, positive testimonials from executives, lawyers and attorneys, military personnel, police and college students, both men and women, who love their classic briefcases. 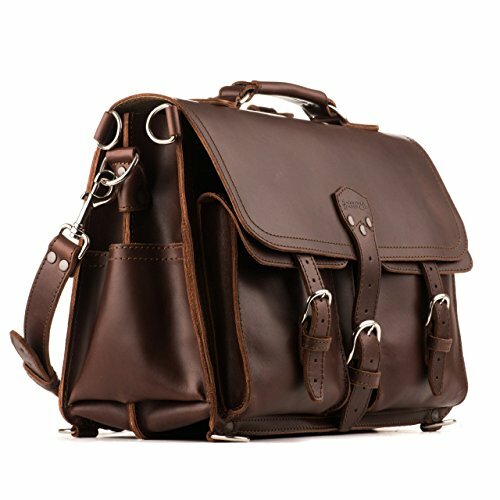 CONVERTS TO A BACKPACK - Carry the classic briefcase over the shoulder, crossbody, by the center leather handle or as a backpack. By looping the removable shoulder strap through the center back O-Ring and attaching the 2 clasps to each corner back D-Ring respectively, the briefcase easily converts into a comfortable leather backpack. 100% FULL-GRAIN LEATHER - The Classic Briefcase is crafted from tough, 100% full-grain Leather, which takes hits well and looks even better with age. Full-grain is the top layer of the cow skin, which is the most expensive and durable part. Much higher quality than genuine leather, our leather becomes soft and supple as it ages. HIGHEST QUALITY MATERIALS - The Classic Briefcase is stitched with marine-grade polyester thread and reinforced with copper rivets for super durability. It is lined with a tough but soft pigskin lining, that is even stronger than the full grain leather and all hardware is surgical-grade stainless steel 316. 100 YEAR WARRANTY - We are so confident in the quality of leather designs, we back everything we sell with a 100 Year Warranty. Our company motto is "They'll Fight Over When You're Dead." 100% FULL-GRAIN BOOT LEATHER - Crafted from tough, 100% Full-Grain Boot Leather, which takes hits well and looks even better with age. Full-Grain is the top layer of the cow skin, which is the most expensive and durable part. Thicker than typical, cheap genuine leather, our leather becomes soft and supple as it ages. 100 YEAR WARRANTY - We are so confident in the quality of leather designs, we back everything we sell with a 100 Year Warranty. Our company motto is They'll Fight Over When You're Dead. Whichever lucky grandchild inherits this satchel, our grandchildren will help them out with any issues that may come up. HIGHEST QUALITY MATERIALS - Like our briefcases, this leather satchel bag is stitched with marine-grade thread, and reinforced with copper rivets for super durability. ÊIt is also built with only a few pieces of leather to minimize seams and weak points and lined with a tough pigskin lining. 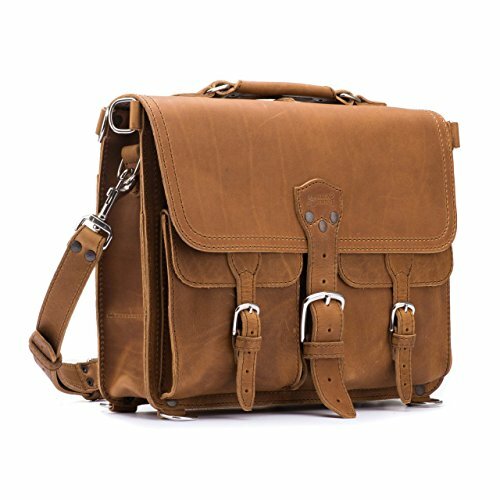 PERFECT FOR TRAVEL OR EVERYDAY CARRY - The Saddleback Indiana Satchel is perfect for carrying your iPad or tablet, wallet, keys, books, phone, point and shoot cameras, passport or any other small accessories you may need. The Indiana Satchel can also be carried over the shoulder or crossbody. 30 DAY RETURN POLICY - We offer a fantastic 30 day return period as long as the item is in new condition. Buying online is tough, especially when you can't hold or touch a bag before you buy it. We want to make it as simple as possible for you so you'll never have to worry. 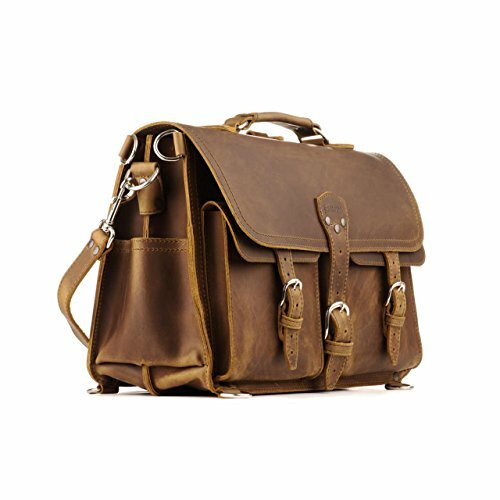 Saddleback Leather Co. Indiana Messenger Gear Bag Full Grain Leather Slim Satchel for Men Includes 100 Year Warranty. 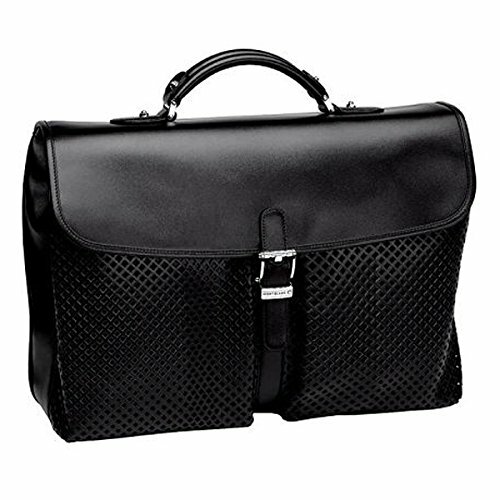 QUALITY STYLE: The slim design of this business briefcase for men always brings your elegance. 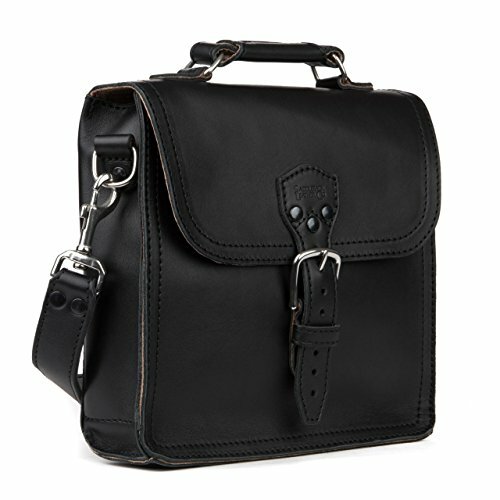 Bag size: 15.7 "* 11.8" * 3.2", Expandable with width up to 9''. Great storage performance is perfect for urban work and business travel. 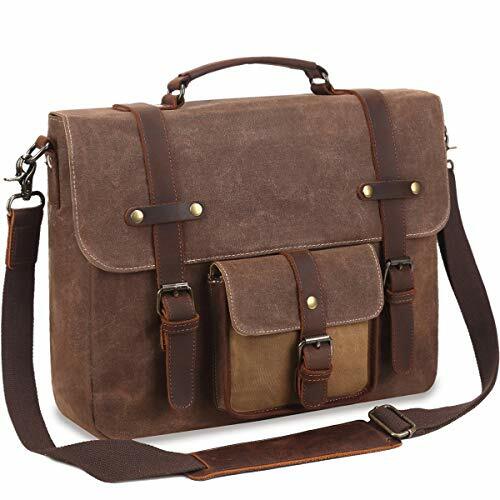 HIGH-QUALITY MATERIAL: This high-quality briefcase shoulder bag is made of genuine leather. Soft surface brings you extra comfort. Durable lining. Accessories are made of silver alloy, durable, anti-corrosion and have a fine finish. An only high-quality material can bring you this great feeling. 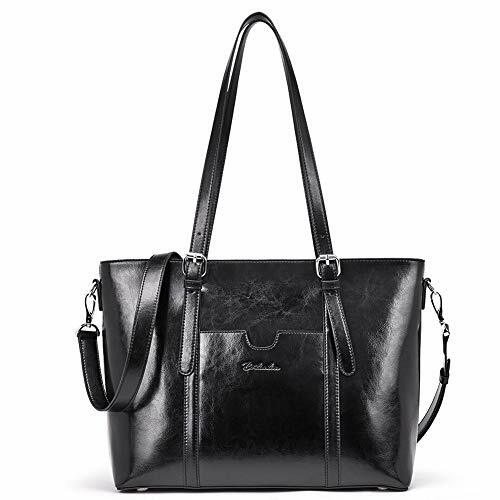 CONSIDERATE DESIGN: Round handle is made of genuine leather and brings you extra comfort. Zipper with dense teeth prevents itself from being stuck and is 10x durable than common metal zippers. Perfect for lawyer、executive、businessman、attorneys、 teacher and designers. 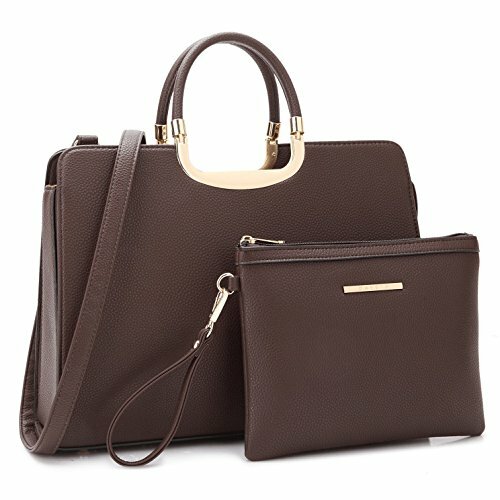 SMALL VOLUME & EXTRA LARGE CAPACITY: The portfolio briefcase bag enjoys a room larger enough for a perfect combination of 4 big compartments and another 4 small ones while remaining ultra slim in outward appearance to keep your computer iPad, files and books well-arranged and compacted together. 270° opening external zipper makes it easier for you to access your items. MODERN AND CLASSIC: Handmade by professionals with Italian leather. 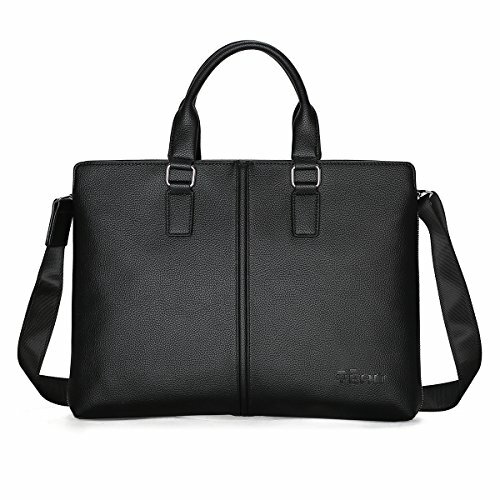 Can be used as laptop briefcase bags、computer briefcase、casual briefcase、legal briefcase、tote bag and travel briefcase bags. 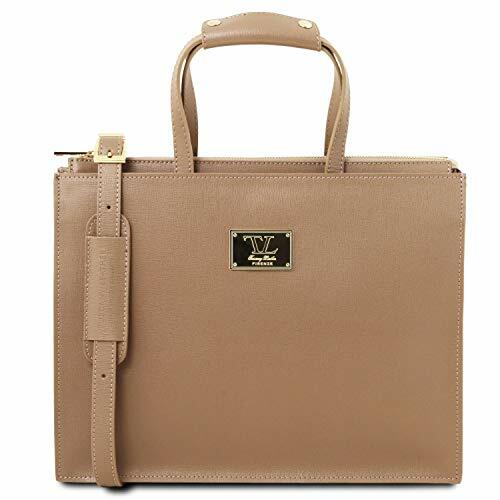 Perfect for business purposes with its creative, luxury and classic design. Can be given as a birthday gift for your family members. ✅100 YEAR WARRANTY - We are so confident in the quality of leather designs, we back everything we sell with a 100 Year Warranty. Our company motto is "They'll Fight Over When You're Dead." ✅HIGHEST QUALITY MATERIALS - All Saddleback Leather Co. products are stitched with marine-grade polyester thread, which is 4 times as strong as commonly used Nylon thread and reinforced with copper rivets for super durability. It is lined with tough but soft pigskin lining, that is even stronger than cow leather and all hardware is surgical-grade stainless steel 316. ✅100% FULL-GRAIN LEATHER - Our Products are crafted from tough, 100% full-grain leather, which takes hits well and looks even better with age. Full-grain is the top layer of the cow skin, which is the most expensive and durable part. Much higher quality than genuine leather, our leather becomes soft and supple as it ages. 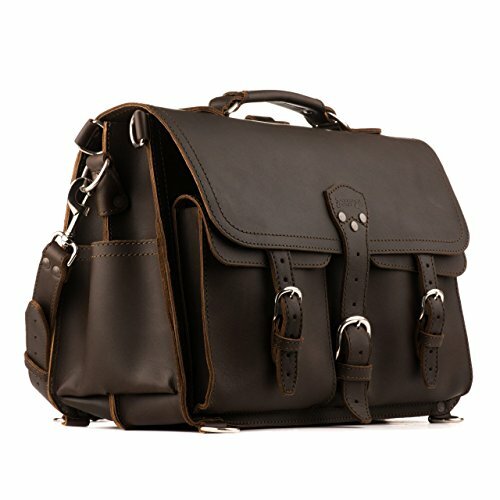 ✅UNIQUE DESIGN FEATURES - All of our products Includes many unique Design features, that prove Saddleback Leather Co. to be one of the most functional over engineered bags in the world. ✅SATISFACTION GUARANTEE: Not Satisfied? Wrong color or size? Return within 30 days for a 100% Full Refund. 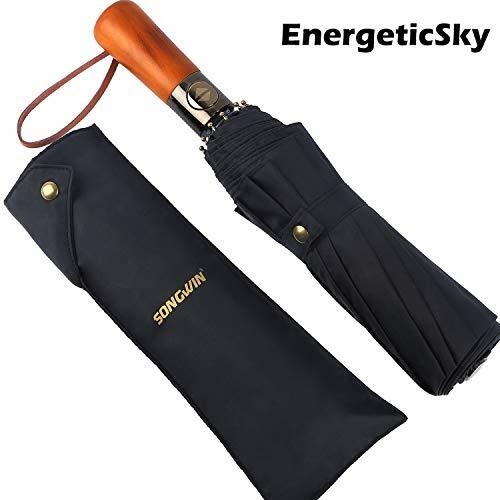 【ULTRA LIGHTWEIGHT & COMPACT】- This compact umbrella is only 7.7 oz weight , 7.2 inch length yet open to form a large 38"(not 34") canopy, fitting perfectly in your makeup bag,briefcase,suitcase or kids backpack. It is also ideal gift for parents, friends, colleagues, lovers. 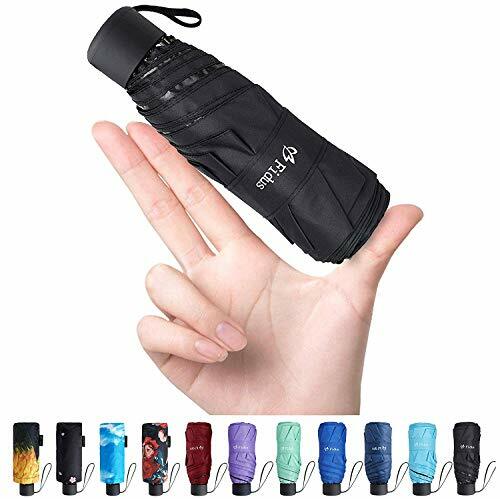 【NO BUTTON OPEN & CLOSE】- Closing and opening is manual while all work in a swift and easy motion.The non-button design ensures your finger not be hurting when close it.Easy to open and close without much strength needed. 1. Travel Companion: Our travel wallet passport holder is designed with 8 pockets, a key chain and a pencil holder, make it convenient to store your travel essentials such as passport, tickets,receipt,pen,credit cards,cash, coins, keys and a 5.5 inch cellphone. 2. Top Workmanship: 100% handmade with top quality canvas and fabric lining. Durable strong zippers and reinforced stitching makes it even more durable. 3. Exquisite Design: designed with a detachable hand strap,freeing your hand during your trip,and made with exquisite material pattern and color, convenient and stylish, perfect for your travel. 4. 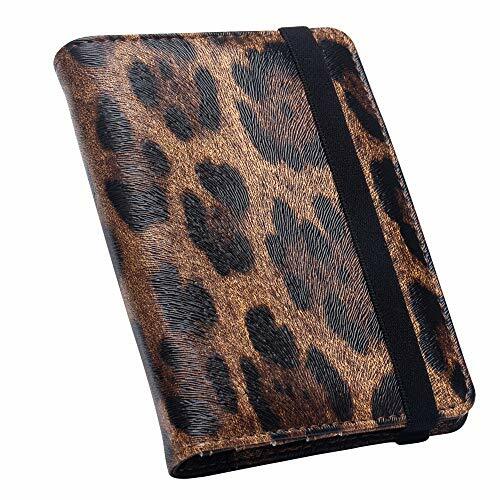 Measurement:dimension of our passport holder is 19*11*2.5cm/ 7.4*4.4*0.98 inch, weight is 114g/0.25lb. 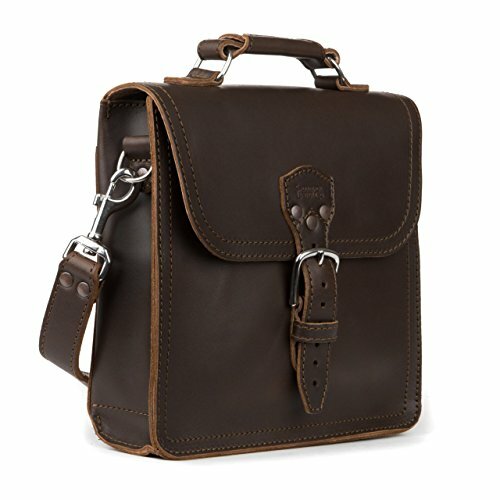 Slim and lightweight to fit a briefcase, handbag, messenger bag or knapsack. 5. Service and Warranty : We guarantee ONE YEAR warranty. Your joyful purchasing experience in Skycase Store is our goal. Please feel free to contact us if any problems, our customer service team will reply to you at the first time. 1. EXCELLENT MATERIAL QUALITY - Crafted from superior soft synthetic leather, no smell, environmental. Nice sewing and reinforced stitching. Comfortable touch feeling and durable for trips. The length of the strap can be adjusted, extended to make it easier to attache tags to the big items. The buckle is made of 304 stainless steel and extremely durable. 2. PRIVACY INFORMATION COVER - Privacy flap & flap button closure, that fully hides owner's information. Keeps your personal information safe, greatly prevent disclosing privacy on your trips, upgrade tags and practical. 3. DOUBLE- SIDE INFORMATION CARD - You can fill in two different information on the FRONT and the BACK side to facilitate switching, easy identification of your luggage, prevent from being picked up by mistake, and reduce troubles of the journey. 4. 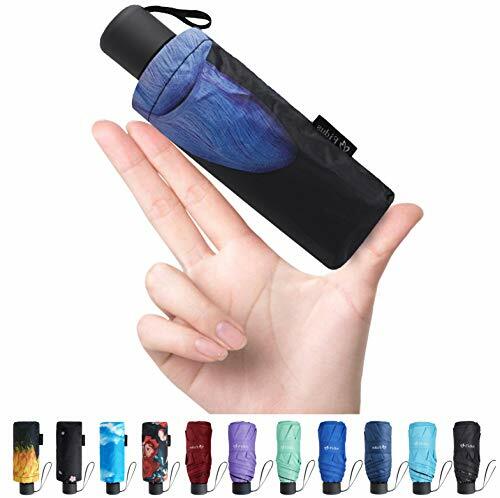 STURDY AND DURABLE DESIGN - Cover with advanced frosted moisture-proof transparent plastic film, water proof, protect your tags from rain or falling out. 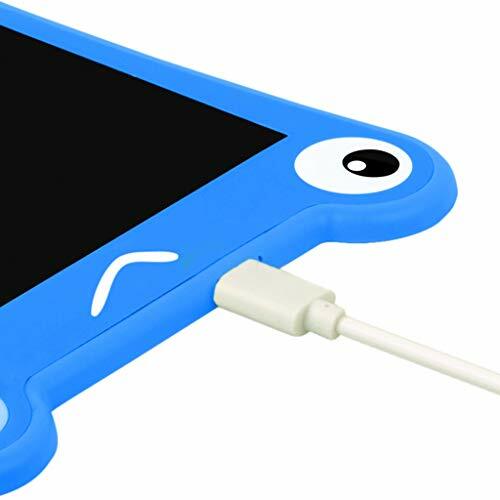 Fully flexible and bendable, squeezed and knocked around without getting damaged. Ensure it can survive in any demanding traveling environment. 5. GOOD FOR ANY LUGGAGE - Tags are great used for kid's school bags, suitcases, briefcase, backpacks, golf bags, gym bags, baby strollers, handbags, baggage, tool boxes or musical instrument covers, etc. These tags can be conveniently fastened through the handle for any bag types. 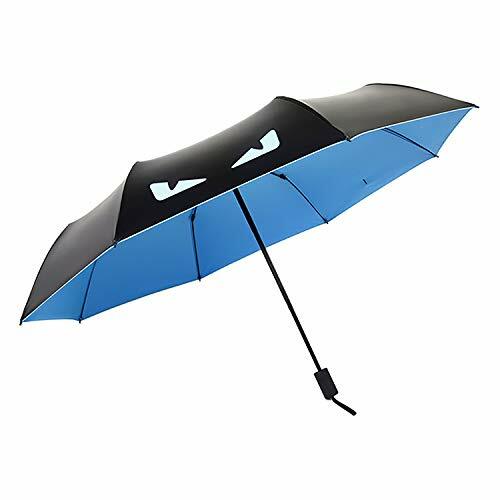 Portable and funny - Our folding umbrella is compact, light weight, stylish and durable for the best quality weather protection,Funny little devil graphics for more situations. PERFECT TRAVEL SIZE - A 3 fold telescopic shaft is collapsible to a small 11.5" in length yet opens to form a large 42" canopy， Small and tiny enough to fit in your purse, backpack, luggage, car, briefcase and more. Mini, portable and foldable design is perfect for men, women, teens, and kids. 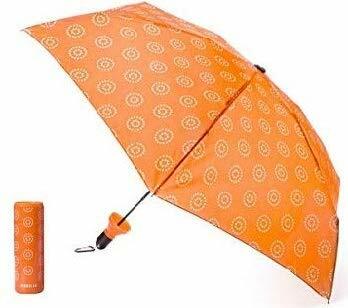 95% UV PROTECTION - This umbrella can protect 95% from UV rays in the test. for both rain and sun, with 95% UV Protection. IDEA GIFT - Perfect gift for Men,Women, kids and students , parents, friends, colleagues ,lovers. 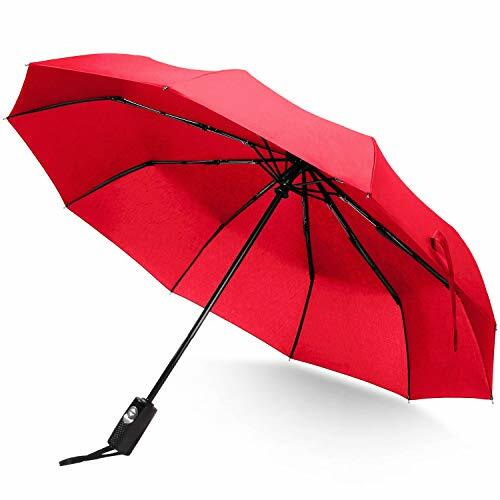 LIFETIME REPLACEMENT GUARANTEE - If anything happens to your brella, we will send you a new one at no extra charge. We warranty all types of issues. 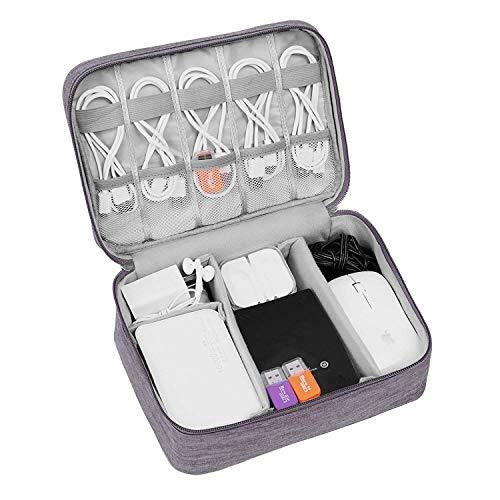 Keep All in One Place - This electronics organizer travel bag will help you to keep all of your electronics accessories and various cables together. No more messy! This will give you a lot of help whether in your trip or in your home. Well Protected - This cord bag organizer is made of double layers waterproof fabric and shockproof material. The high-quality zippers are sturdy and durable.Double zippers closure ensure your item secure. 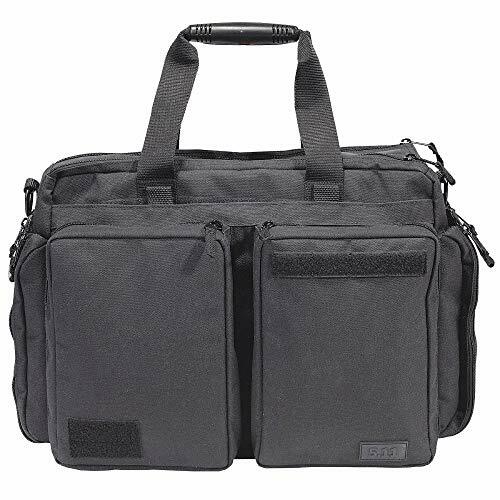 Easy to Carry - This organizer electronics accessories bag is lightweight and easy to carry. It takes up a small space.Perfect size easily fits into your briefcase, luggage, backpack and handbags without taking much space. MULTIPURPOSE:This electronics cable organizer bag also can be as cosmetic carrying bag, baby health care kit storage bag. Most versatile organization system designed to hold items firmly in place, Endless configurations Perfect companion for your laptop bag or travel case. Genuine crazy horse leather, soft, classy and durable. CRAZY HORSE LEATHER: The name of this leather was given because this type of leather is popular with horse saddles. Saddleback and Distressed leather are also common terms used to describe crazy horse leather. The leather has been treated to look and feel aged while retaining it's toughness. The more you use it, the better it looks. RFID-blocking lining to protect your personal information, keeps contents secure and in place. The pocket can hold a 10 years passport with no problem and enough room for two passports (one either side). Dimensions: 5.9'' x 4.25'' x 0.39'' / 15 x 10.8 x 1cm. Weight: 2.7oz / 78g. POCKETS: 1 spacious pocket for paper cash; 1 passport pocket (right-hand side); on the left-hand side: 1 vertical pocket for cash, cards and misc. 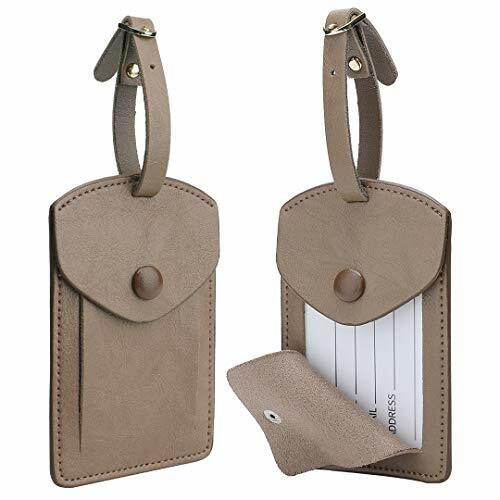 paper items, 3 card slots to store your ID commonly used credit cards or transit cards, 1 pocket for your boarding pass, receipts, coupons, or a multitude of other items. GIFT BOX: This wallet comes in elegant gift box packaging and would make an ideal gift. 2. 【Environmentally Friendly】 - Using this writing pad will help save trees, paper and money.Erase images and words with only touch of a button,The button is conveniently sealed and integrated into the tablet, and the screen can be erased over 50,000 times during the life of the tablet. 3. 【100% Happiness Guarantee】 - Your satisfaction is guaranteed when you buy this product. You're not only guaranteed to be happy with your order, but they're also going to be a good quality Digital Handwriting Pads. If you're not satisfied with what is shipped to you, you can either return it for a full refund, or just request a replacement. In either case, we'll make it right, and you'll be happy. 4. 【Lightweight & Portable】 - To make the digital notepad we use high-quality materials which are durable. Thanks to its thin design and lightweight, it can easily be stored in purses, scheduler, briefcase or child's backpack to accompany you where you go! Ideal for kids, students, business men, designers and so on. 5.【Easy to Set-up】 - For both left and right handed use. The pen doesn't need to be charged so you can start creating immediately. Four customizable Express Keys put your favorite shortcuts at your fingertips. Feels like pen and paper: Imagine writing with pencil, ink, or pen...all while saving trees on a reusable, portable, paperless device! FABULOUS FEET: Harborsides' flats make your feet feel fantastic! These are by far, the most comfortable shoes you will ever own, as they feature a memory foam insole and Flex A Lite Outsole. DELIGHTFUL DESIGN: This "Grape" style shoe features a vegan upper, an easy slip on style, and a crisscross buckle accent on toe. VERY VERSATILE: Wear these flats with any pants, jeans or leggings for a relaxed, yet classic look. They can also be carried in your purse, briefcase or backpack, for when you are wearing heels and your hurting feet are begging for a break. PREMIUM QUALITY: Made with the best quality materials, and designed for durability, so you can enjoy wearing them for years to come. PICK YOUR COLOR: Available in Black, Brown, Cognac, Navy, Rose Gold and Silver. 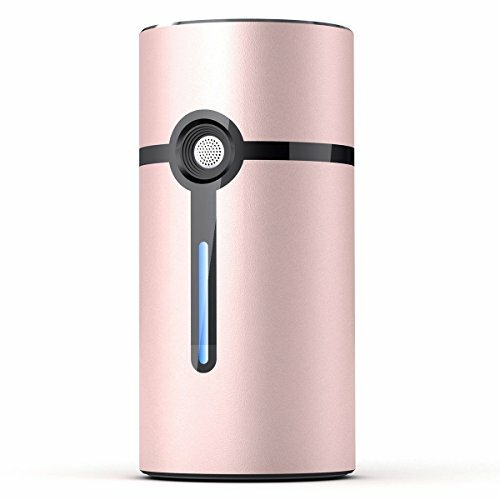 KEEP ALL IN ONE PLACE: It will help you to keep all of your electronics accessories as power bank, phone charger, cable and else together and easy to be found. 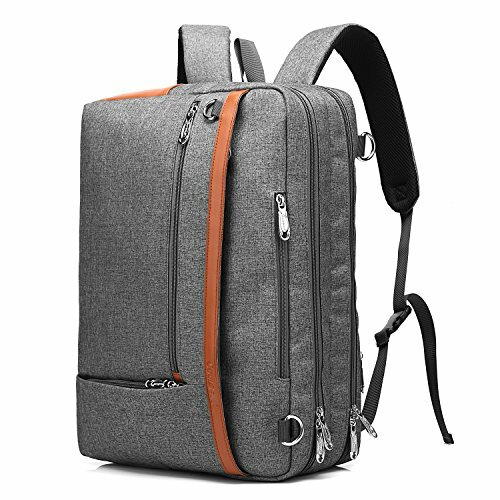 LARGE CAPACITY: It has 2 layers terylene interior compartment with enough space to take in your cables, USB drive, cellphone, charger, mouse, kindle, mini tablet and other accessories. 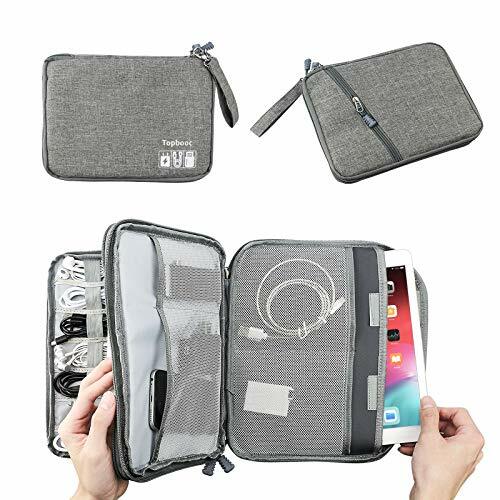 HIGH QUALITY MATERIALS: made of high-density waterproof and shockproof fabric and durable metal zipper, which can protect your electronic accessories effectively. EASY TO CARRY: It takes up a small space. 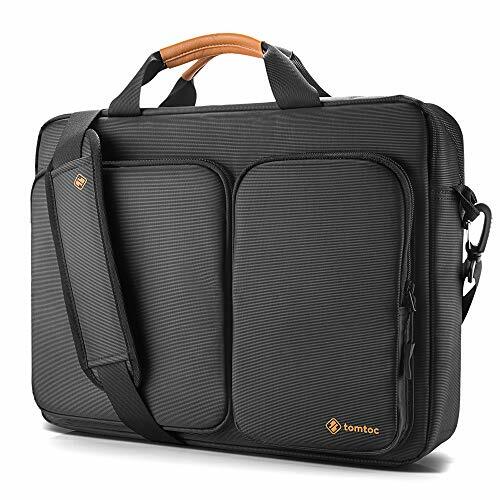 It is perfect partner for your hard drive at travel or in the office. Perfect size easily fits into your briefcase, luggage, backpack. AFTER-SALE GUARANTEE: If you are not satisfied, you can contact the seller at any time. We will do our best to solve the problem for you until you are satisfied. 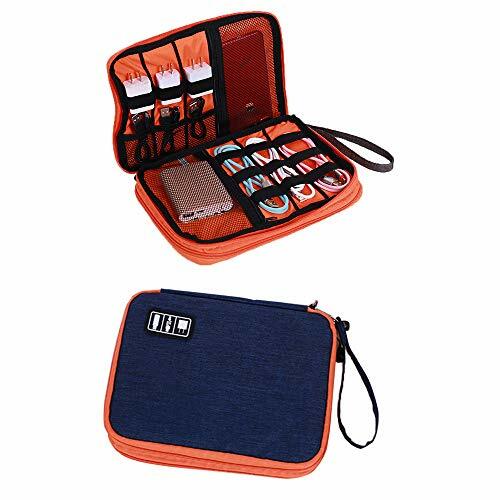 1.Keep all in one place: The cable organizer case is made of heavy-duty, durable and water-resistant nylon nylon, enough roomy to hold various items like cables, flash disk, Cords, Memory Cards,USB drive, Power, Charger, passport,Adapters ,Pens, Headphone and etc. 2.Excellent protection:The versatile cable organizer bag is well padded semi flexible covers offer excellent protection for your electronic accessories. 3.Premium quality: The organizer travel case in medium size which is made of heavy-duty, durable and waterproof nylon material offer excellent protection for your accessories. It can protect your digital accessories from damage. 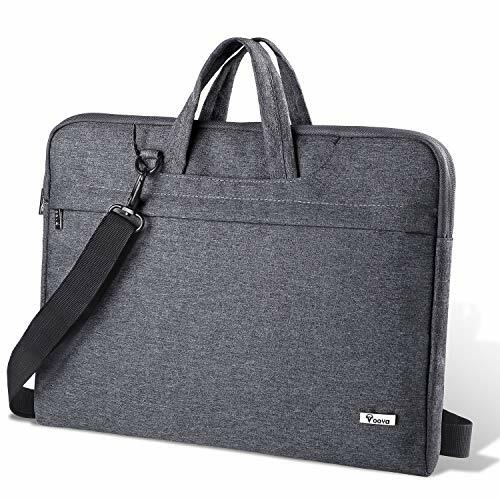 4.Easy to carry: The electronics travel organizer is lightweight and spacious designed greatly can carry everything you need when you are on the go. Perfect size easily fits into your briefcase, luggage, backpack. 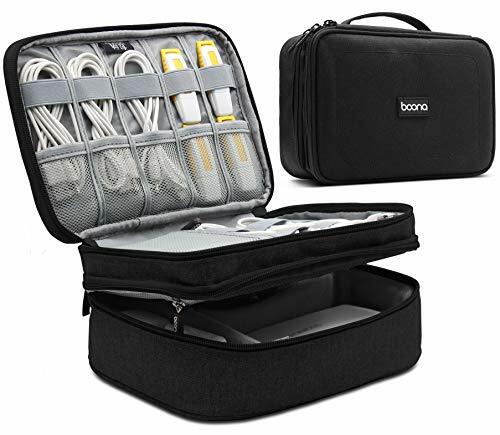 5, Multipurpose: The Electronics accessories case also can be as Cosmetic Carrying Bag. Most versatile organization system designed to hold items firmly in place, Endless configurations Perfect companion for your electronics Accessories bag or travel organizer case. 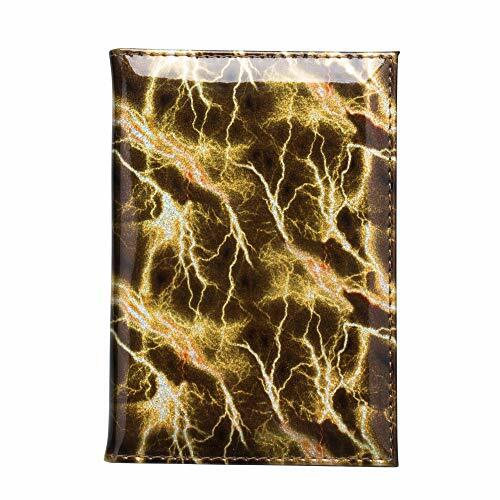 Material:This lightning pattern passport holder made from high-quality pu leather,the material feels like a real leather and have better waterproof, dirtyproof and wear-resistant properties.it is more durable to use. 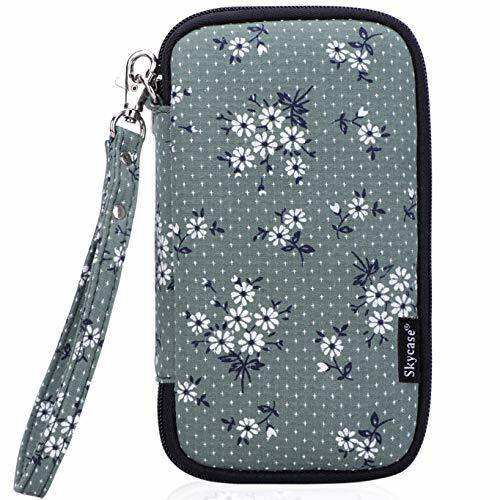 Passport Case Cover Size: 9.8cm X 14.2cm (3.9" X 5.6") is ideal for standard US passport , slips into your pocket / briefcase / handbag easily. 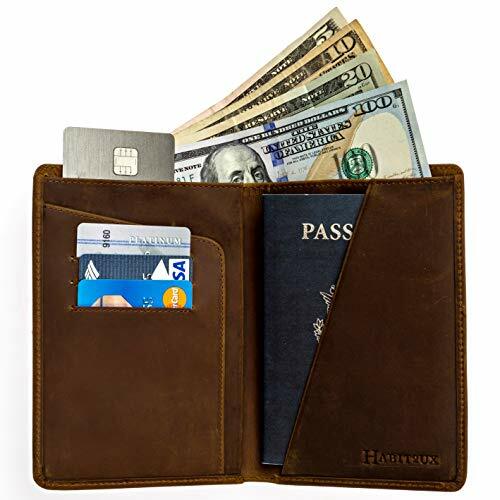 Travel Priority :The lightning pattern passport wallet is great holder for travel essentials. Yet with the multi-function elastic, you may put the passport wallet in a pocket. AUTOMATIC, COMPACT, FOLDABLE. Automatic function allows for easy one-handed operation, with 41 inch oversize canopy to fit 2 people, weight 0.75lb,compact size is extremely packable in purses, briefcases, backpacks, luggage and more. SUPERIOR WATER-REPELLENCY. Made of 210T water-resistant pongee micro-weave fabric for resisting percussion,windproof,mold-resistant; and with high quality teflon coating ! FULL FIBER GLASS RIBS. 10 resin reinforced fiberglass ribs which made of hardened stainless steel coated, strong enough to against strong wind or heavy downpour, the chrome plated black metal shaft to allow for greater stability in high winds. Firm and Anti-rust ! 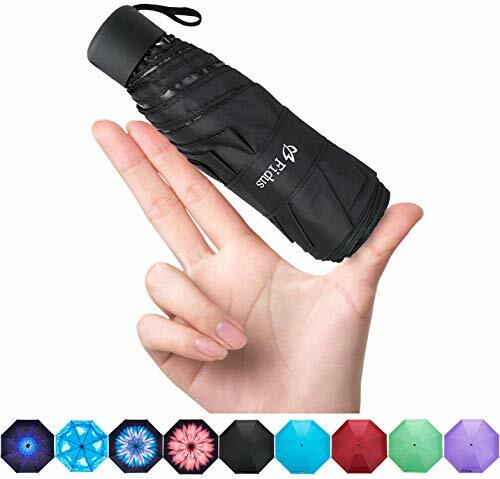 COMPACT SIZE: The umbrella can fold into a 12 inches conveniently compact size, a useful addition to any travel bag, backpack, or briefcase, Its compact size makes it a great choice for any on-the-go traveler, or for anyone who likes to be prepared !